What a day! The Boss is off work for the rest of the week, so after yesterday’s day of catch-up (tons of laundry, clean-up, shop-shop-shop) we were determined to be properly outside today. All 3 minxes ate a big breakfast, so obviously all that lovely fresh air and exercise in Orkney has had a bit of a lasting good effect. 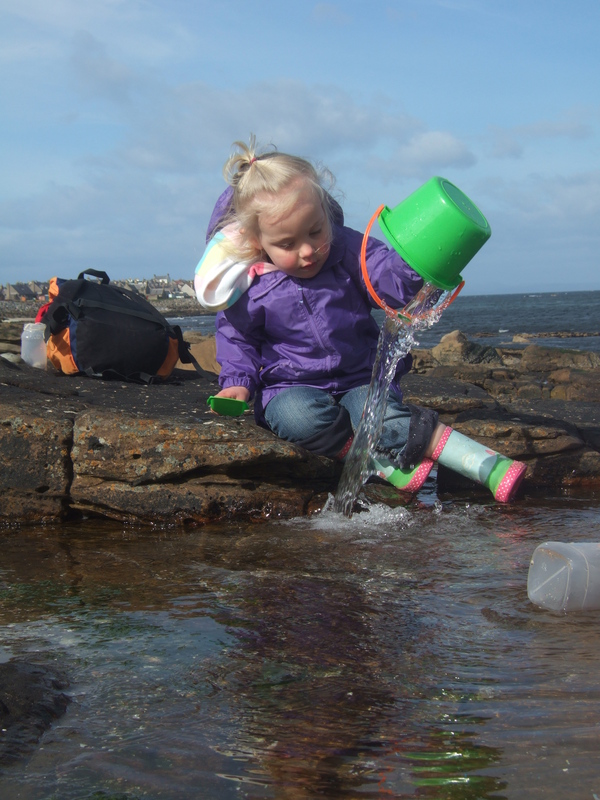 Quick scatter of a ton of dried-in mud from 4 pairs of wellies onto the clean hall floor <rolls eyes> and off for a 10 minute walk to our own little spot of beautiful windiness – rock-pooling just along from the local maltings. 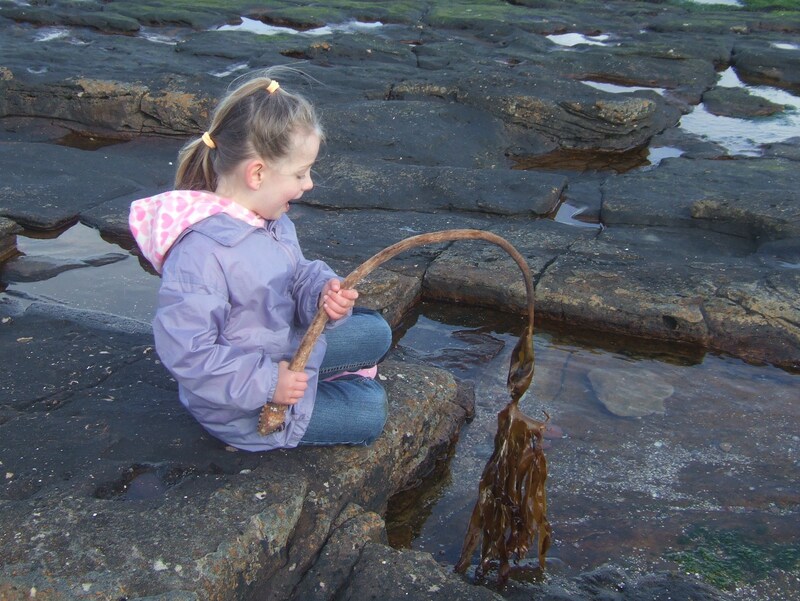 As usual I found the stripey stones and boulders there mesmerising, while the girls preferred to slither amongst the seaweed. 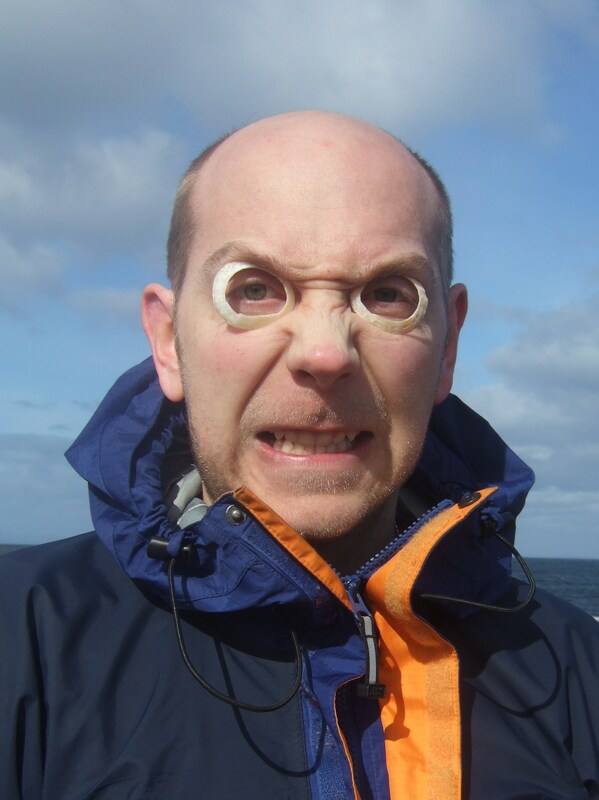 The Boss searched for sea glass (he’s a bit obsessed…), which Maxi helped him with. But it was meeee who spotted the purple bit <preen>. 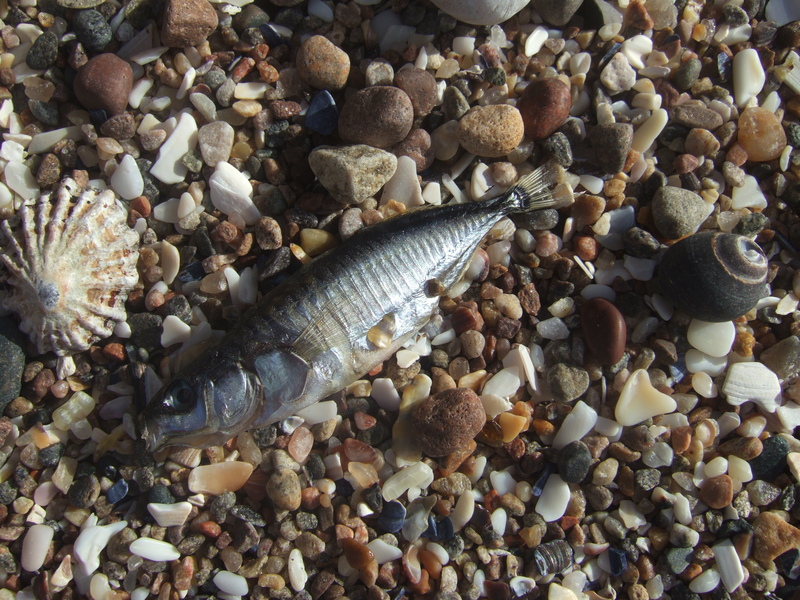 I also found a freshly-dead fish, but I’m not sure what it is – little mackerel? Sprat? Little herring? Maxi beach-combed for shells, kelp and sea anemones, Midi dug industriously (for what I don’t know – a bigger, deeper hole?) and Mini settled in happily to our first proper back-carry in the wrap. We were only out maybe 90 mins or so, but by golly we needed the scooby snacks (kids – smarties and banana pieces) and hot coffee (grown-ups). That wind was stronger than ‘gusting 30’ and it was bitter. So we traipsed back, pondering over how bees are born, and watching a lorry fill up with malted barley at the maltings, ready for a distillery. For once, my clean washing wasn’t bombed by seagulls (horrible vermin generally splatter on my washing at least once a week, and once got me and baby Mini when she was 4 weeks old – half-digested fish and ammonia, bleurgh), so in a fit of sunshine-induced vigour I decided to mow the front and back lawns. Well to give you an idea of how much the grass had grown, I completely filled the (vast) compost bin and the big brown wheelie bin… Quick zoom down to the village and back with Mini in the buggy to post some parcels (paid-for eBay sales – hooray! ), then collapse on the living room floor – sooooooore back! Mini is a happy wee sausage today. She’s properly cruising along the furniture and can walk holding onto Midi’s toy keyboard stand on wheels. Mini’s just discovered how to make Maxi’s harmonica work by sucking as well as blowing. I’m not sure all the drool is helping the sound much, but when it burbles too much she just squeals and shrieks with delight anyway. No-one can hear much for a minute or so after Mini squeals – too bloody loud. Another Mini first – she can drink out of a normal cup with handles, no lid. I just kept refilling it with a wee dribble of water in the bottom. I’ve already warned The Boss that we need to let her feed herself completely now, even the sloppy stuff, because (a) she can, and (b) she gets furious when you ‘baby’ her. Shields up! 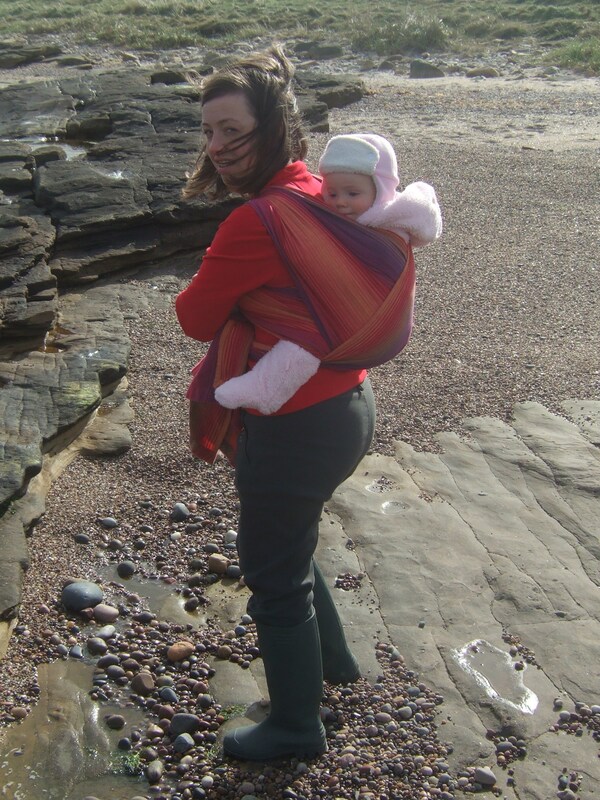 This entry was posted in baby milestone, Out and About and tagged baby cruising, baby-wearing, back wrap cross carry, children, cup drinking, eBay, girasol 26, harmonica, lawn mowing, rock pooling, sea gulls, washing by GrumpyOldTrout. Bookmark the permalink.